Line the bottom of a small jar with the salt. Smash the cloves of garlic and place them in the bottom of the jar. 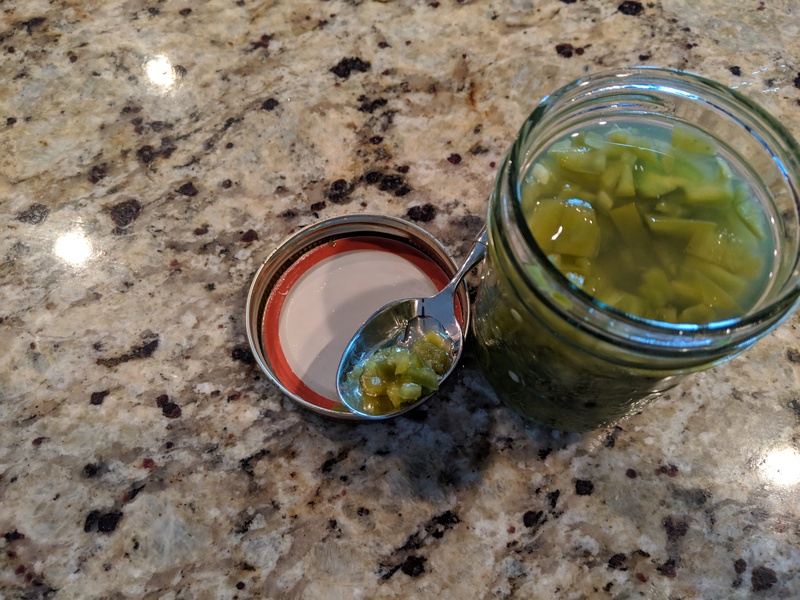 Finley dice the jalapenos and add them to the jar leaving a little space at the top. Bring the water and lime juice to low boil. Pour the liquid into the jar. Allow to cool for about 30 minutes. Put the lid on the jar and place it in the fridge. In 3 days, you’ll have the chow chow. Good on beans, chips or, well, anything. Have lots of Tums or Rolaids on hand? Jack. How many jars make a peck? Dang, now I wish I’d planted jalapenos instead of green chilis. I’m stealing that, maybe I can sell it to Yaco hell, there hot sauce bites. Major Hose.